The main reason I wrote in this blog, was to keep my sanity and use it as a journal of all my thoughts throughout the process. 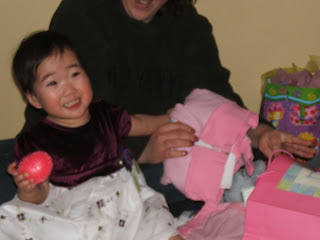 Something to give Mei Lin a history for a part of her life she is likely to not remember, and as well, to educate others who are starting the adoption process on all the ups and downs of International Adoption. I think I have done that. Our journey to our daughter has ended and we have started a new chapter in our lives. The other day we celebrated 6 months that we have been a family and Mei Lin is everything I have ever dreamed about and more. I hope each and every one of you get the chance to meet her at some point in life. 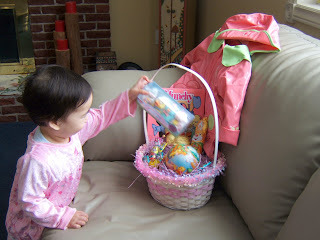 She is the happiest kid I have ever met...somebody had to have taken good care of her! 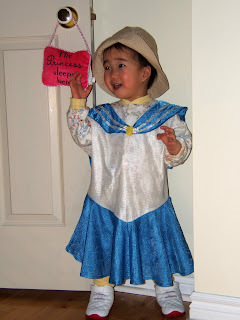 I'll miss writing in my blog, but there is just no time for it anymore...and at this point, I have to step back and think about how this is Mei Lin's life after all...and it's her story to tell someday...when she's ready. 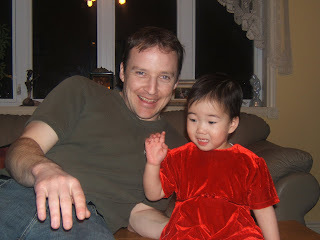 Here are my most recent pics of Mei Lin and I've put 2 new videos on the right side of the blog! Thanks for tuning in and keep in touch. 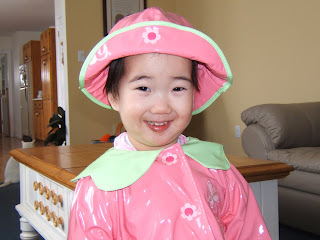 I have just finished updating the 100 Wishes for Mei Lin blog! You can find the link on the right hand side of this site. My camera died so there are 1 or 2 left to enter, and I will as soon as I get a chance. Our goal is 100 pieces for the quilt...we currently have 26 posted on the site...plus one or two more to add. So...still a long way to go, we are only a little over a quarter of the way there. Thank you to everyone who has sent Mei Lin a piece!! Take care all, looking forward to seeing your pieces!! We are back from IWK. All I have to say is that Mei Lin is an amazingly determined little girl. She had her surgery on Wednesday morning and I cried as I watched this tiny little girl walk down the long corridor looking up trustingly at the nurse while holding her hand...not looking back once. She barely cried when she woke up in recovery...just for her mommy to hold her closer. Her tiny little mouth was swollen and bloody, but she was a trooper. We left the recovery room at 3:30 in the afternoon and by supper time she was eating and drinking. I couldn't believe it! After having the surgery she just had...I couldn't do it! Later in the evening she was smiling and laughing and doing a little talking. By 8pm though she had enough and it started to get to her. 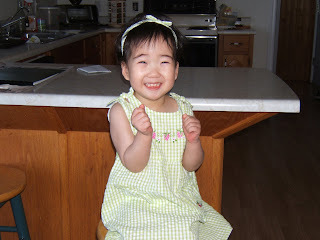 Her little arms were in restraints so she couldn't bend them and get her fingers in her mouth. This was starting to get to her because she has a rash and was trying to itch and scratch...but couldn't reach. And she didn't like the taste of the meds at the hospital. Apparently they don't get the bubble gum flavoured kind that mommy gets. After a few hours of trying to watch Mei Lin sleep with her retraints on her arms and seeing how uncomfortable she was, mommy decided to take off the restraints and just stay awake and watch to make sure she didn't stick her hand in her mouth and ruin her surgery. Thursday morning started out very tired and lathargic. 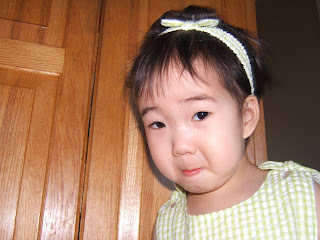 Her face was more swollen than the previous day and she couldn't open her mouth much. She wasn't drinking or eating anything and hadn't had a "pee" in 24 hours. 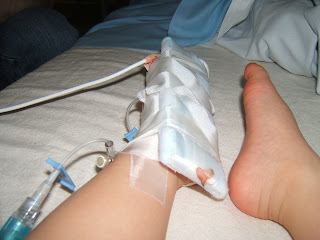 The doc said we would wait 2 hours and if no pee...they would have to use the cathedar. So mommy and daddy tried everything to get her to pee, finally we tried the old hand in warm water trick and .5 hours before the cathedar was due...she had a pee! And she started feeling better, the IV came out and the doc sent us home!! It is 9pm...34 hours after her palate was repaired and to look at her, you would never know she had anything done. She is playing, screaming, laughing...all her normal things. She is stronger than I will ever be! Her little voice has a new clarity to it and Daniel and I are amazed o hear Mei Lin speak her words so much clearer already! 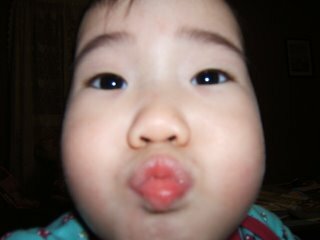 Mei Lin's IV...she took this one herself, not a bad little photographer! Mommy and her brave little munchkin! Mei Lin after hearing the news that she was going home! Wow...long time since I've posted!! Been soooo busy with Mei Lin. She definitely keeps me on my toes!! I also took a little bit of mommy time and went to the Dominican last week for some R&R before Mei Lins surgery next week. We will be going to Halifax on Monday or Tuesday for her pre op appointment at the IWK where they will tell us what will happen and how to care for her, and she has her palate surgery on Wednesday morning. She currently has a nasty nasty rash all over her little body and it is driving her nuts!!! It is apparently from the laundry detergent that was used on her clothes. I hopefully will have it cleared up before her surgery, I wouldn't want her to be itchy and have her little arms in restraints!! Any suggestions on how to clear it up? ?...she is completely covered in small red bumps!! Other than that, she is doing great!! She did really well the week I was away, and when I came home Tuesday night, Daniel was in the process of putting her to bed. I walked in the bedroom and she sat up, her little jaw dropped and she just started into the giggles!! She hasn't let me out of her sight since!! I missed her very much when I was away...one day I called home and she answered the phone with "hi mama"...wow! she is starting to put words together!! She also used the potty on her own while I was away...geesh, all the stuff I missed!!! 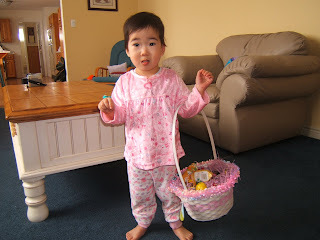 We are excited to celebrate her first Easter this weekend, it will be a good weekend before she has her surgery! I hope to post some pics soon....and thanks to everyone who sent quilt pieces...I'm behind on updating the website. Not much time on my hands these days!...still looking for pieces if anyone would like to send!! 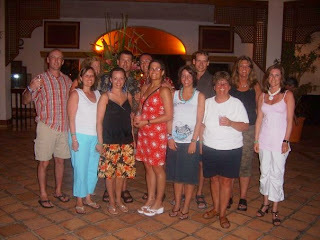 Here's a pic of the Dominican gang! The Arsenault's are feeling better! So, here are the birthday pics I promised and videos are above...still having problems with my camera batteries...so quilt blog is still not updated with recently received wishes. 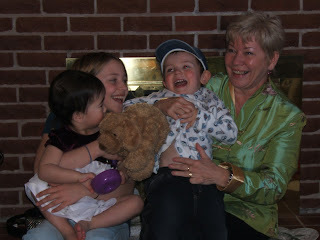 Grammy Gamble and the Grand Kids! 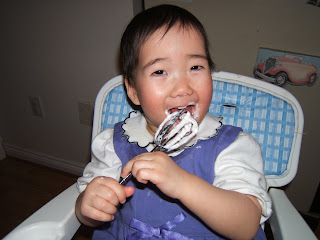 Yesterday, Mei Lin turned two! She likes to tell you that she is two as she proudly holds up 3 fingers!! (she just can't seem to keep that extra finger from popping up!) We celebrated her birthday on Sunday with family and she had a great time charming the pants off of everyone! She let out roars of excitement (and I mean roars! 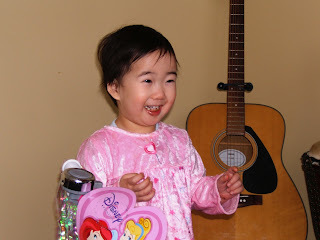 )everytime she opened a present! I have lots of pics and funny video to post for you all, but I need to recharge my camera batteries first. 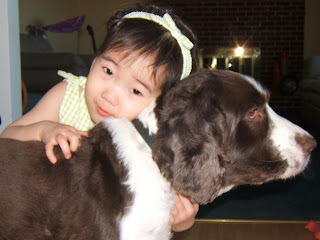 I have been sick since Monday and haven't had the energy to do much with the blog. Starting to feel better today though...but little girl woke up at 3am last night with a very high fever. She is very quiet and sleepy today with not much of an appetite (very unusual), and I found out that when she is sick she gets a purplish line all around her little lips...and her eyes get big and dark. She is enjoying her new potty...mostly throwing toilet paper in it right now....but she catches on fast. She has been peeing in her diaper and then telling you she needs potty...a bit backwards...but like I said, she catches on fast. I also have 8 or 10 quilt pieces to add to the 100 Wishes Quilt blog. So if you haven't seen your quilt piece there yet...I haven't forgotten about you, I've just been sick and the camera has been without batteries! 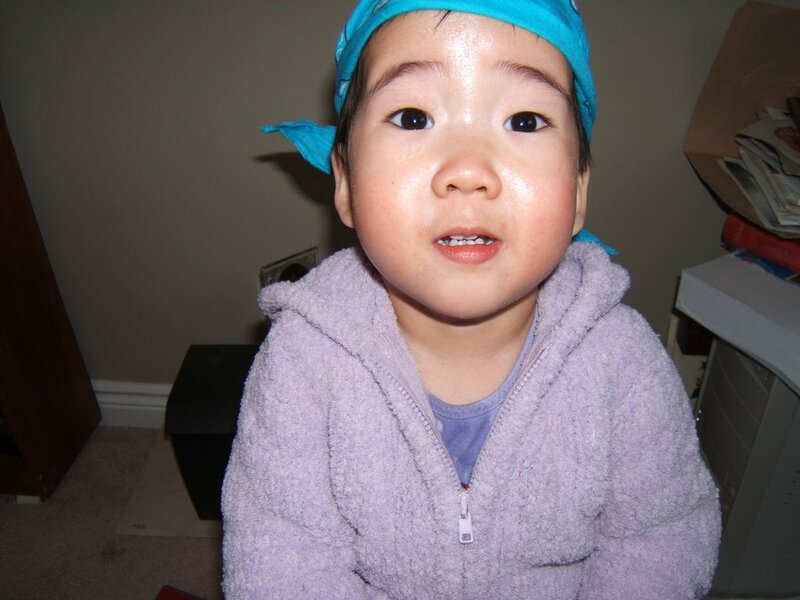 A quick good luck, and travel safe wish going out to my sister Angele who has finished her stint in Korea and is now going to spend the next two months in India travelling around before coming back to Canada. She has a friend there, so I hope they keep her safe. Thinking of you Annie! Stay tuned, birthday pics and videos coming soon! Ha Ha!! Yes, it is true, I don't get out much these days and lately it has been roughly once a week. 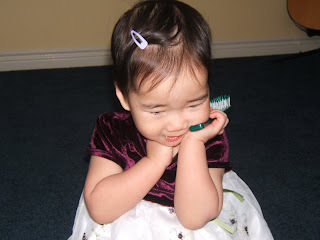 But today, Mei Lin woke up with a smile on her face (after a full night sleep) and things were going good, so I jumped at the chance and actually got to have a shower, yes a shower!...called up my sister and made some plans for Mei Lin to interact with some other kids!! We spent 2.5hrs at my sisters and Mei Lin and Rory played and hugged and shared snacks and giggles!...We then went home and scooped up daddy to go out for supper (yeah, supper too! )...the waitresses were singing "happy birthday" to everyone in the restaurant it seemed, so they offered to sing to Mei Lin as well (it is her birthday next Wednesday)...well, they came out singing happy birthday with a piece of cake with a candle in it! At first she looked at them like they were crazy, but gave them big applause when they were finished. 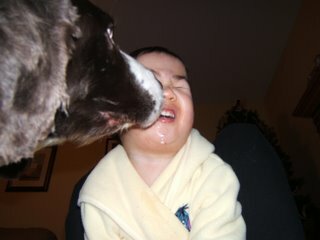 She then blew out her candle in one big drooly blow! By the way, this kid LOVES chocolate!! 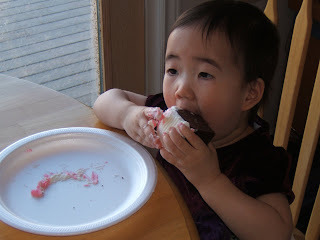 When I went to take the plate away, as there were only crumbs left, she screamed! And when I went to wipe her fingers off, she quickly snapped them away as she still had finger licking to do!! We then scooted off to Walmart to buy the big birthday present! (yes, she was there...but she doesn't know!! 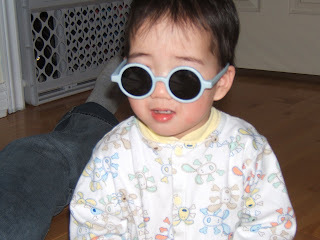 )...we got her a potty that makes the flushing noise and we also got her a pair of sunglasses...when we got home she put the sunglasses on and she ran and danced and had so much fun, she loves to act "cool"!! I love seeing her so happy! Mei Lin was born in the year of the Rooster (2005). “Gung Hey Fa Choy!”; “Wishing you prosperity and wealth!” It is known as the Spring Festival or Chinese New Year. The exact date of this holiday is based on the lunar cycles of the Gregorian calendar, so the date falls in either January or February every year. There are many preparations to ensure a new year of good luck. The observers of Chinese New Year carefully clean out their houses before the celebration begins, so the bad luck is cleaned out of the house. The cleaning is preformed in a precise manner. They sweep the floor towards the door, encouraging the bad luck to leave the household. In a way, Chinese New Year is like spring cleaning to its celebrators. Each family member wears a new outfit for this special occasion to display a new start. Before the party begins, families burn incense and offer a feast in front of their family shrine. When the holiday feast begins, the celebrators makes sure to dine with un-chipped and un-cracked plates. Some treats children enjoy are candies wrapped in gold foil, chocolate coins and sweet sticky rice. Everyone wishes each other good fortune by exchanging red envelopes, Lai See Hong Boa, filled with an even amount of money. The Lai See Hong Boa envelopes are inscribed with good luck characters in the front. 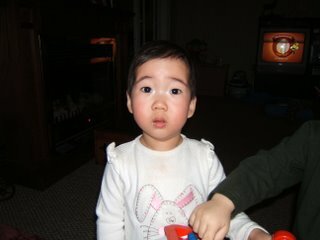 For the past two days, Mei Lin has been saying "I LOVE YOU" quite freely! Perhaps she knows it is the time of year where we express our love to the ones most dear to us. Today, she is expressing her love to her daddy who is at work on Valentines Day! 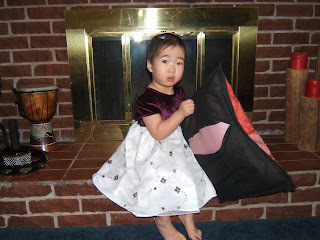 Oh...and I added a slideshow to our 100 Wishes for Mei Lin blog (find the link on the side)!! As Mei Lin would say "cool!" 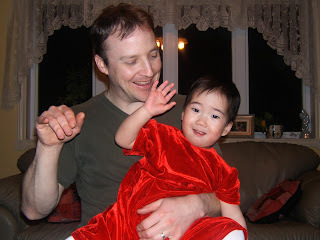 I have created a blog especially for Mei Lin's 100 Wishes Quilt...on it I will include pictures of all quilt pieces that we receive and the wish attached to each piece so everyone can see our progress!! We have gone from 5 to 7 pieces...long way to go, so keep them coming!! I will also add this link to my list of favorites for quick and easy access. The Clow's finally have their little baby, Kennedy Joy!! 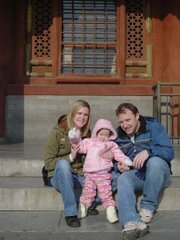 As some of you know...our friends "The Clows" have just arrived in China and will meet their new 10 month old daughter Kennedy tomorrow. From what we experienced on our trip...and since they haven't posted yet...lets have some fun...perhaps I can shed some light on what it is like that first day you arrive! After you get off the plane and grab your luggage, you make your way down what I call "the red carpet"...you feel like a celebrity! There are hundreds of people standing along the side holding signs, waiting for their people to arrive, you can't understand what they are all yelling, so it is almost like they are cheering you on. It was very emotional, like you finally realize what is happening!! It's rush hour, so you then take a 1hr bus ride to your hotel where your group has already been checked in by the facilitator...you just have to be given your key. At this time you would go to your room...re-arrange your luggage, as you have to leave some of it in Beijing before departing the next day (weight restrictions are much less in China), do some money exchanging...and go to supper with your group where you will be told what will happen the next day when you receive your baby. So, by now (it is 1:30 am in China)...Carolyn and Marvin are lying in their beds staring at the ceiling...because they can't sleep. (I am guessing)...because Carolyn just can't stop talking and counting down the seconds till they see Kennedy and Marvin is wondering who won the hockey game!! Ha Ha!! They will get up in the morning, go to breakfast...get on the bus with the rest of their group to be taken to the airport where they will be escorted to their gate. The plane to Nanchang will be delayed 1hr due to smog...and Carolyns countdown will be messed up and she will have to start a new one!! (just having fun! )..the plan will be to go to their hotel and get freshened up before going to get Kennedy...but from our experience, everything in China is unpredictable...so I predict, they will arrive late (due to the smog delay) and then there will be no time to go to the hotel...they will go straight to Kennedy!! Oh the adrenaline!! Anyway, thanks to those who responded in regards to the quilt. If I haven't responded to your email as of yet...I soon will! And please pass the word on! 1. The way she sits and watches TV while enjoying her snack...she loves her snacks! 2. The way she uses her hands to gesture us to "come here". 3. The way she rocks her head to her favorite songs...so delicately. 4. The way she will stroke my face when she is sorry. 5. The way she holds her doll, rocking her and patting her back while she whimpers as if to say "poor baby". 6. The way she says Banana "Nananana"
7. The way she will grab your attention if you are not paying attention to her...she will get in your face, tilt her little head to the side and say "hi" over and over!! 8. The way she will bandaid everything with a kiss...including when mommy is mad...she will kiss me on the lips as if to say...okay, all better! 9. The way she sometimes smiles or claps in her sleep. 10. The way she never walks...she runs everywhere!! 11. The way she sometimes falls asleep while eating cheerios! 12. The way she mimics everything we do! 13. The way she loves. Okay thats more than 10...but I could go on forever!! Now onto her 100 Wishes Quilt. I am not making any progress...so I figure, I have had 500 people visit this blog in 5 days...that is roughly 100 people per day! 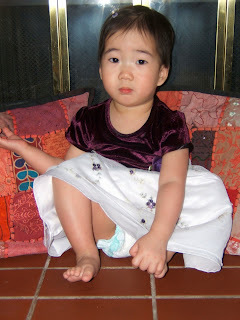 And I need 100 pieces of fabric and wishes for Mei Lin's quilt. I currently only have 5 pieces (thank you to those that sent)...that means I have 95 pieces to go!! At this rate, I am thinking that maybe all I can make is a pillow case!! I would really like to get this started before I go back to work, so send them if ya got em! Email me at dannat@pei.sympatico.ca for my mailing address. 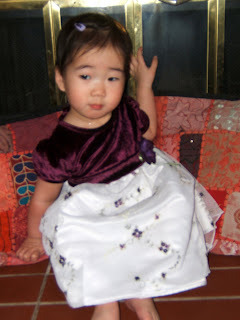 Perhaps I will start up a second blog for all the quilt pieces that we receive. And if I have your email...expect to be hearing from me!! 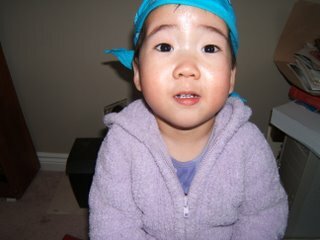 For some video of Mei Lin...check out my cousin's website. 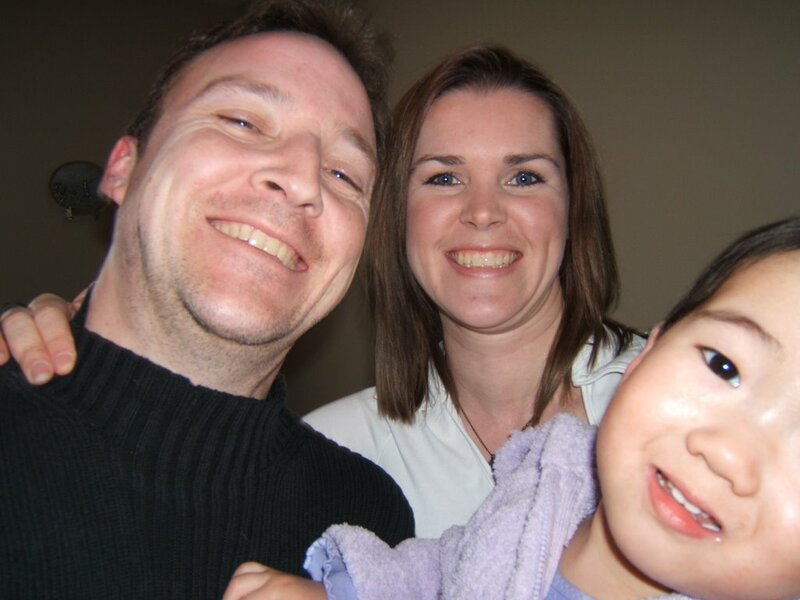 You will find the link to her blog on the side called " Our Family in Ontario". And check out my new links and videos on the right hand side. I will try to switch them up every now and then for you. And can anyone tell me why my video's are cut off on the right hand side....is there a way to size them to make them smaller to fit the column width???? All is well at the Arsenault's. The girls together again...this one made me laugh out loud, anyone care to add a caption??? 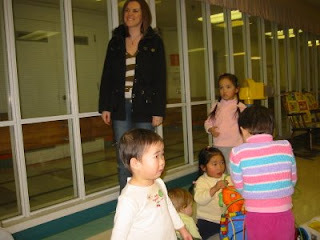 Yesterday was Mei Lin's IWK assessment visit. We decided to drive over the day before so we would have lots of rest. We arrived at the Four Points Sheraton (used last of the aeroplan miles for that one) at around 5pm and went for supper at the Niche...nice place, good food. Mei Lin was sooo funny...the waiter was getting a good kick out of her. She was sitting just so in her high chair...music playing in the background and she would shimmy her shoulders to the music while she chewed on her food!! Wish I had the video camera!! After supper my cousin Wendy and her husband Steve from Eastern Passage came to visit Mei Lin at the hotel room. 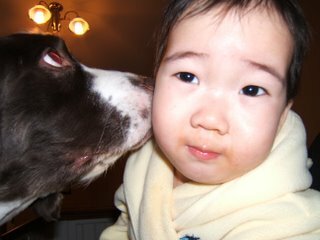 This was their first time meeting her and Mei Lin was hyper, hyper, hyper!! She warmed right up to Wendy, it took her some time to get used to Steve but eventually she was sitting on his knee! 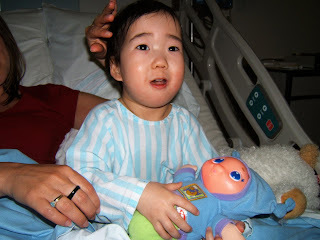 We got up nice and early the next morning, ordered room service for breakfast and found our way to the IWK. What a great hospital! And wonderful people! 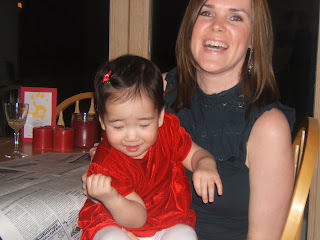 Mei Lin was very comfortable with the Cleft Team and they all thought she was just the bees knees!! She did really well, and the surgeon said it may only take one surgery to repair her cleft (surgery date April 11th tentative). So we will cross our fingers. She also saw a pediatrician who checked her over, an orthodontist...who said she will possibly need some teeth work down the road...an audiologist...her ears are fine!! And she had some blood work done to see what she needs for shots etc. She didn't mind the blood being taken...but she hated being held down!! All in all, she did well...and after 4 hours straight of poking, prauding...no breaks, bottles or snacks....she was ready for a sleep...she fell asleep walking to the cafeteria where she slept on the bench while we ate. My brave little girl!! Highlight of the trip (and sorry I don't have pictures!) was seeing Quleanja and her family again. Quleanja was adopted at the same time as Mei Lin so we were excited to see how they would react to seeing each other again. Mei Lin was very busy...but I noticed Quleanja looking at Mei Lin quite a bit! We also got to see her two sisters Fumairia and Christelinda, who I missed very much!! They are just the best girls!! Our two month forever day anniversary photo...a bit chaotic looking...but a true relection of our lives these days....and yes...that is me with brown hair. This space may eventually become my travel blog..for all of my caribbean adventures! If you haven't guessed already...time is scarce these days, and blogging and email are no longer at the top of my list. Not to mention that Mei Lin HATES when I sit at the computer!! 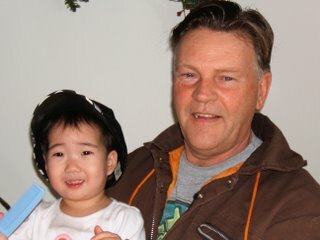 The last two weeks have been really great for Mei Lin. She has taken a turn for the positive. The screaming and crying to tell us what she wants has almost stopped, as she is using the words mommy is teaching her instead. So now, the two of us are having better days and enjoying each others company a little more. She has stopped testing us on everything as well...I figure she has just run out of things to test my patience with...and is probably scheming in her head for the BIG one!...which I'm sure will come soon! She is sleeping fairly well in her new "big girl" bed. She still wakes through the night...but we are all resting a little better. and I Lubv for I Love You! 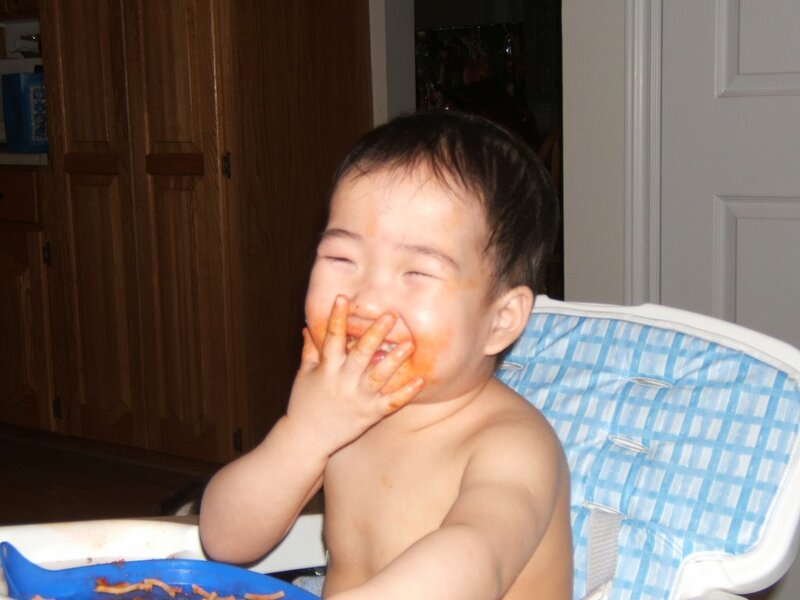 This is just the cutest, happiest adorable kid! I can't imagine her any happier! She is always laughing and smiling! 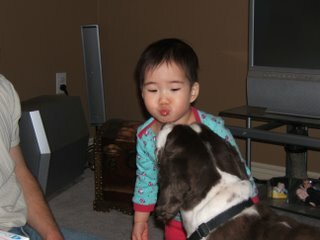 She loves to give kisses and has recently learned how to hug back! Here are some pics of her loveable self! Sucking up to Rory after stealing his chair! Always kisses for her puppy! God, I love that face!! 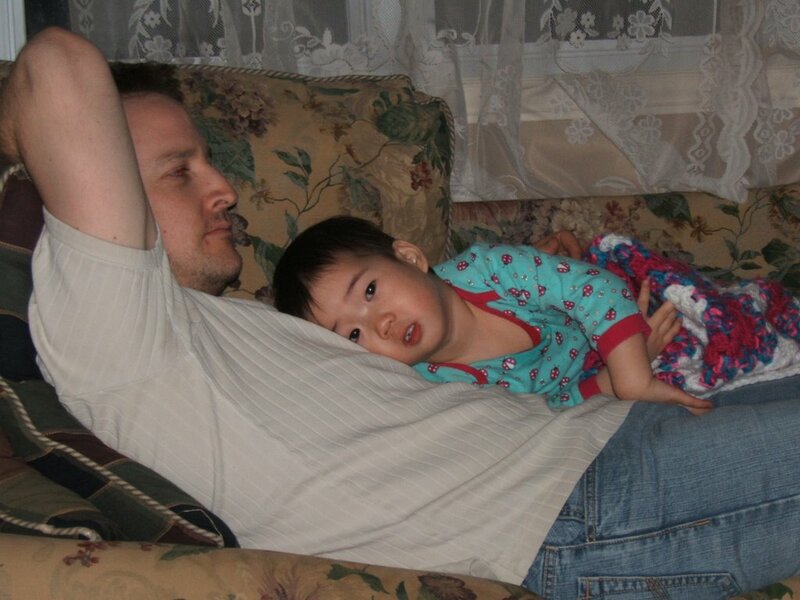 Quiet time on the couch with dad, before bed. This time next week we will be in Halifax...getting ready for our 8:30am appointment at IWK. 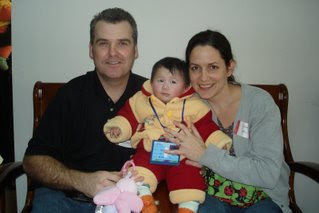 They have a whole cleft palate team that will take a look at Mei Lin and assess how much surgery she will need. She will also be looked at by a speech pathologist, audiologist, a dental surgeon...and god knows who else! It will be a very long day for Mei Lin!...wish her luck! 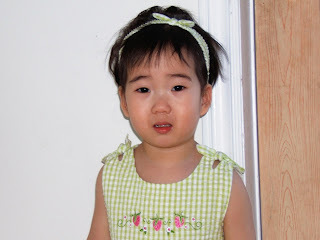 Mei Lin had her ear tubes put in this morning. She was soooo good. She was smiling all the way! She laughed and giggled as I carried her to the operating room with my hair net on and scrubs. She thought that was just the cats meow. It was a very short procedure, and the doctor said that there was a significant amount of fluid in her ears and it has probably been there for quite some time. Meaning, everything she has been hearing these past few months has all been muffled. I hope that now that it is done, her speech will develop more and she will start to use more of her words. 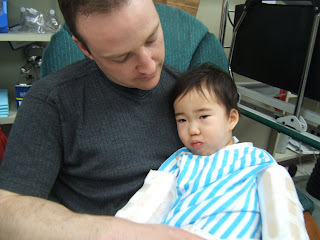 She was quite upset when she woke up from the anesthesia, and we heard her first "real" cry for her mommy and daddy, it broke my heart and I found it hard not to cry in front of her. Tonight she is spending her first night in her big girl bed. We have found that her crib is just too small for all the rolling around she does, and our bed, well...she beats me up in her sleep every night...so, we are done with that. Hopefully this works out for us. 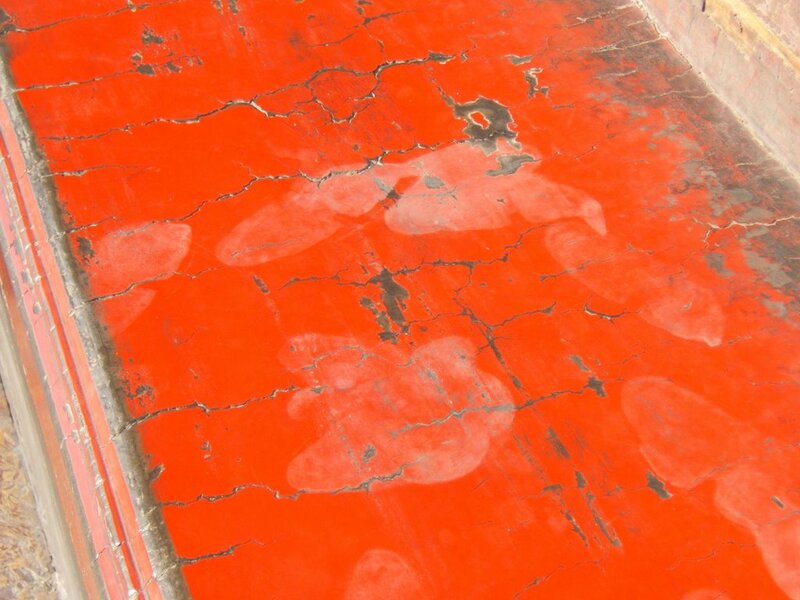 Mei Lin's footsteps at Tianamen Square in Beijing. My Aunt Lorraine past away in her sleep last night, she was 52. I was always nicknamed "Little Lorraine" all my life because of our strong resemblance. She was a beautiful artistic person, who has suffered greatly these past few years. She has been suffering from dimentia and it has been very hard for the family. Her husband passed away suddenly from a heart attach in July. I take comfort in knowing that they are now up in heaven talking and laughing like they used to. Please pray that their children find peace in knowing that. 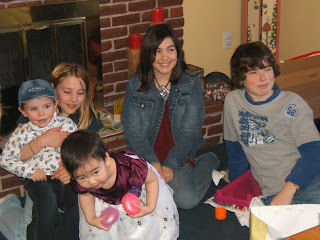 I've been tagged by Carolyn! I don't usually do these, but Mei Lin is sleeping...and I need to talk about me for a change! B - Best Friend: Daniel...he's put up with me for 17 years!! D - Drink of Choice: ha! ha! these days...a good stiff one would be nice...but I have to be responsible because I'm a mommy...so, I will say water! G - Gummy Bears or Worms: Neither...not liking the candy really. I - Indulgence: Lately, Chocolate seems to get me by...We got lots for Xmas and I'm trying to get rid of it all as soon as possible...he he! 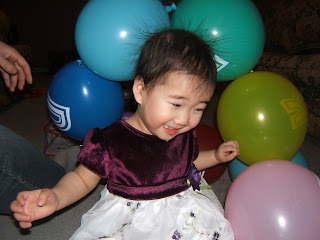 J- January or February: February...Mei Lin's first birthday party!!! Q - Favorite Quote: "What doesn't kill you will make you stronger"...very true! 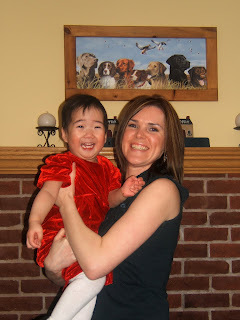 R - Reason to Smile: I have a daughter! S - Season: Summer! I hibernate in the winter and barely leave the house! V - Veggie You Don't Like: turnips...when I was little, we weren't allowed to leave the table until we were finished eating...I used to put all my turnips on my sister Angele's plate when she wasn't looking. 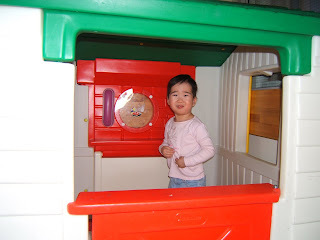 She used to have to sit there for HOURS!! 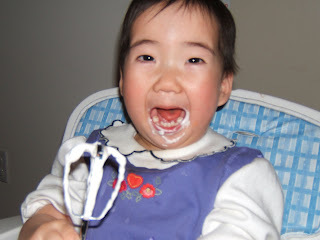 She doen't eat turnips to this day! Hmmmm...wonder why! W - Worst Habit: smoking. Although, since going to China...I have only smoked about 5 % of what I used to...I'm getting there! Y - Your Favorite Food: Turkey Dinner with all the trimmings!! "Daddy, can I come too??" 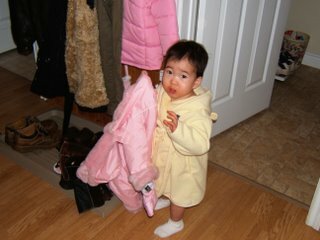 ~ she always reaches for the coat when one of us is leaving...she wants to go too! My favorite picture to date! 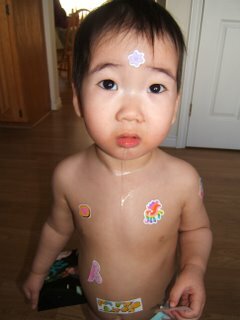 She loves her stickers! Someone's gotta clean up the drool!! ~ Murray's just doing his part! 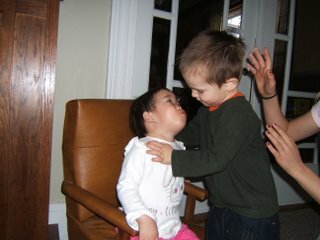 Love Without Boundaries...and how you can help!